Most musicals include two or three memorable songs for audience members to hum upon leaving the theatre. The exceptional shows might offer four or five. Then, there are the “Guys & Dolls-type” productions in the musical cannon, which boast at least 10 top hits that stick in your brain for days or weeks at a time. It seems impossible for anyone to not know and enjoy the following: “A Bushel & A Peck,” “Luck Be a Lady,” “Sue Me,” “The Oldest Established,” “If I Were a Bell,” “Adelaide’s Lament,” “Sit Down, You’re Rockin’ the Boat,” not to mention the title song. 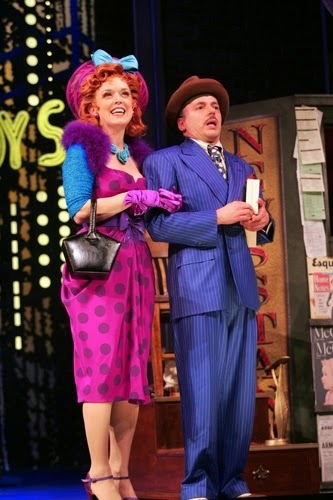 Originally staged on Broadway in 1950, two Damon Runyon stories morphed into “Guys & Dolls” -- a tale about men and women in boot-leggin’ NYC. The guys are gamblers with dice; their gals are gamblers in love. The focus of the plot are two couples; Sky and Sarah (both quite handsome), Nathan and Adelaide (both quite average). The audience roots for love to conquer all in spite of numerous setbacks for this quartet of vulnerable people. Most productions “star” Sky and Sarah. After all, they are the pretty ones. Yet, Goodspeed’s star is clearly Adelaide. Nancy Anderson is a knockout. Yes, she can sing (with a droll nasal New York accent), and her body and legs are something to hoot at. More importantly, this gal can act. This reviewer has oftentimes dismissed Adelaide as stupid and whiny, given filler songs to beef up the show with humor. Anderson takes the shell that other Adelaides on other stages have worn and fleshes her out, body and soul. Mark Price (Adelaide’s beaux Nathan) plays conniving with a sweet touch. Manna Nickols (Salvation Army drum-beating Sister Sarah) uses her near-operatic voice throughout. Tony Roach (Sky Masterson...whata’ great name) sings well, spices up “Luck Be a Lady” choreography with nice moves, but shows little emotion in romantic scenes. Superb is the word to describe the skills of the ensemble of singers/dancers. Their accoutrements embellish their many fun moments; i.e. herring bone suits, fedora hats, bouffant hairdos, and speaking style (just try leaving out contractions...it’s not easy.) 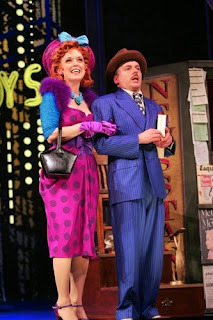 The jazzy, colorful set is primarily NYC in lights, with side trips to the mission house, crap game cellar, and Havana. The eight-piece band (only eight?) never eclipses the voices. So, be a lucky lady or guy, and enjoy some great talent at Goodspeed.